Tom Cruise is one who, I believe, wears height increasing footwear. The style would obviously depend on the character he is playing, or his own personal taste if he wears them as a regular thing off the set. Love your killer outfit buddy, powerful and confident for sure! Indeed the self publishing routine on Amazon and on Kindle Unlimited is dire. The majority of it is extremely amateurish and poorly edited - if they've had any editing or proofreading at all. There is a much darker side too as described in this feature in the Guardian today https://www.theguardian.com/books/2019/mar/28/plagiarism-book-stuffing-clickfarms-the-rotten-side-of-self-publishing I have learned to avoid books that are listed on Kindle Unlimited or anthem that appears self published. It's really a shame because good writers have in the past made their start via the self-publishing route. But nowadays they are all swamped by drivel and distinguishing the oats from the chaff is too big a hassle. I had never read Lynda LaPlante until the other week when I picked up one of her novels on the 99p special deal - Bella Mafia. I quite liked it. I had heard of her, but had never read one of her novels and took advantage of the low price to get acquainted. I like my Kindle Paperwhite very much - it has been a lifesaver on long flights. Now I can take several hundred noels wit me and be certain that I'll have something I like to read with me. David Guterson's Snow Falling on Cedars was a boy I had been meaning to read for years now and which I picked up for 99p and enjoyed quite a bit, although the flashbacks became rather trying after a while. I could see the point of them, in the story, but I can't help but think that they could have been reduced in number with a bit more thought given to story structure. Just thought I would try to generate a bit of discussion on the forum. I’m part way through Shadow of the Wind, by Carlos Ruiz Zafon and am enjoying it. It is very imaginative. About the magic of books. I’d not read anything by him before, but picked it up on spec on the 99p special deal for Kindle books Amazon runs each day. They usually put out three books for 99p and I have been using that randomness to broaden my reading list. I don’t buy every day, but when there is a title that looks interesting by an author I’ve not read I snap it up. As a result I’ve got rather a backlog of books to read. Some have proven to be real turkeys despite the illustrious name of the author and others have been real finds. I think that's a good idea, especially as regards other general topics and friendly exchanges. 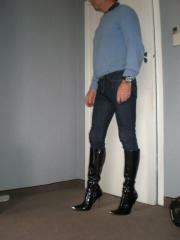 I certainly favour tall boots without heels, and wear them quite a lot, over skinny jeans. I’ve also taken, lately, to wearing cheerfully coloured Converse All Star sneakers as a means of fun self expression. I am just into wearing just heels with men’s clothes. That’s why I joined here ( joined the other site as I found that first). Yes, Not was the word that should have been in there. I have corrected it. I agree - it is great that girls have more openings and are not being pigeonholed but boys need the same latitude and there seems to be little movement in that direction. I don't recall any interest in heels when I was young or that much interest in footwear in general, other than a general feeling of being left out because girls could wear interesting boots and boys could not. Then, as now it seemed unfair. It was not a fetish thing or an obsession, just a fashionable wistfulness that manifested itself in the autumn when new boot styles would appear in the high street shop windows and I would realise, ruefully, that all of them were 'forbidden' to me. Although there is much talk of genderless play and toys these days, nearly all of that is about making certain that girls do not feel obligated to stick to pink and girly toys, but feel free to explore their inner selves. Boys are still overwhelmingly directed to boys toys.